2011 Polaris RZR 800 SxS, Lots of Options, Winch, Cab, Heater, Radio, Glass Windshield w/Wiper, Very Clean. The 2011 Polaris RANGER RZR® is the industry's only trail capable side-by-side (Check applicable laws for trail requirements). It has Razor-Sharp Performance and 30% better fuel range for 2011. Only Trail-Capable Side X Side—50" Width: With a 50" width, it goes where other Side x Sides can't. With ZF Sachs shocks on the corners and the lowest center of gravity, it's the definition of razor-sharp performance on the trails. On-Demand True All-Wheel Drive (AWD): True AWD keeps you moving, automatically engaging all four wheels when you need more forward traction and reverting back to 2WD when you don't. Glove Box Storage: Passenger-side glove box has 3 gallons of space for convenient, water-resistant storage. Redesigned Body Style: The front end has new styling for an even more aggressive look when you're riding on the trails. The redesign also increased the cooling airflow area by 29%. Incredibly Agile And Lightweight: Exclusive front and rear anti-sway bars keep the chassis flat while cornering. Dual Front A-Arms and Rolled IRS allow for adjustable precision. 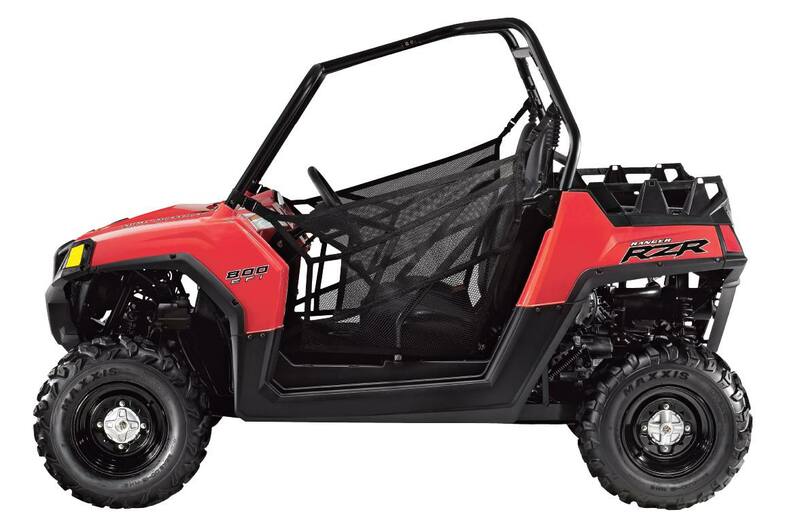 With class-leading low weight, the RZR has a massive hp-to-weight ratio, giving it unbeatable power and acceleration. Lowest Center Of Gravity: Patented engine-behind-the-seat design provides the lowest center of gravity at 20.3", easily beating the competition and delivering agile, razor-sharp handling. 800 High-Output Twin EFI—Fastest Acceleration: High-Output engine cranks out 53 hp and delivers the fastest acceleration, from 0 to 35 mph in 3.8 seconds. Extended Rear Cargo Box: Redesigned with 60% more cargo volume and extended sides to strap down and carry more gear and supplies to easily bring what you need on the trail.